There are a few different ways to go about creating and sharing a video resume. Creating and distributing your own video file is one option, but there are many advantages to using a video resume platform like Spark Hire. Here are the top five reasons why you should use Spark Hire to host your video resume. With Spark Hire, your video resume is hosted on a website. This means that instead of worrying about distributing a file to professional contacts (these files are usually large and can disrupt email and social media feeds), all you have to do is share the web address of your Spark Hire profile. Contacts can follow the link and view your video resume easily on Spark Hire’s website. This is wonderful for sharing your information via social media. Simply add your Spark Hire profile link to your social media platforms, and start networking effortlessly with your video resume. One of the limitations to submitting a video file to a potential employer is that weeks or months can pass before anyone looks at it. This is plenty of time for your resume to become out-of-date. You would hate to apply to your dream job and not be able to tell them about your most recent accomplishments at work! By giving potential employers a Spark Hire profile link, you can update your resume at any time. Regardless of when you submit your application, employers will see your most up-to-date resume when they visit your Spark Hire profile. Although some video software is easy or free to download, who needs another program taking up hard drive space? (Remember saying “You’ll NEVER fill up that one gigabyte hard drive”?) Spark Hire’s video resume platform doesn’t require any downloads or fees. All you do is look at your webcam and click record. Spark Hire also has space for creating a job search profile right on the website. 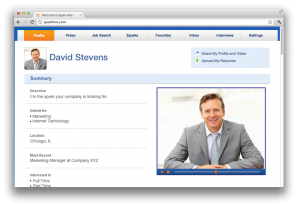 By sharing your profile link, you are not only sharing your video resume but your traditional one as well. We’ve talked about the advantages of video interviewing. It can make the life of a job seeker way easier. By using Spark Hire’s video resume platform, you introduce an easy-to-use medium for employers to conduct a video interview with you. Although using Spark Hire’s video resume platform is no guarantee that an employer will contact you about a video interview, it can certainly start the conversation for you.